Separate your feet about one foot. Point your toes straight back. Place your palms beside beside your waist. On an inhale, push down into the floor with your palms and lift your torso up. Straighten your arms and let your head drop back as far as possible. Straighten your legs completely by tightening your kneecaps and keeping them lifted away from the floor. Only allow your palms and toes to touch the ground. Contract your glutes. Stretch your spine, thighs, and calves. Push your chest forward and engage your triceps (opposite your biceps on your upper arms). Remain in this shape for 30-60 seconds with deep breathing. 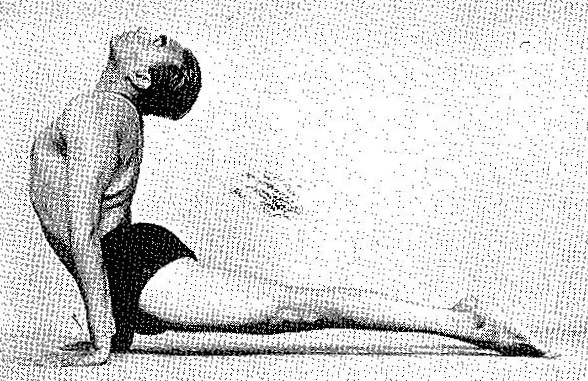 Notice that unlike Bhujangasana (Cobra Pose), Iyengar's shoulders are directly above his wrists. Thus, this backbend is not quite as deep and is more about engagement and balance, whereas Cobra is about gaining the leverage to maximize mobility. I notice that in so many of these backbends, I am following my training at the time; hinging my head back using only my lower cervical spine (C4-7). I'm not using my atlas (C1), although Iyengar certainly is. The atlas has a much greater extension ROM than the other cervical vertebrae, and I have found since this shoot that resisting its use in backbends is unhealthy for my body. However, most kinesiologists agree that when humans extend the atlas, the rest of the cervical spine flexes and vice versa. Balance and paying attention to one's own unique body is key; emphasizing only extension at the atlas may cause flattening of the cervical curve, which may cause pain and inflammation. However, maintaining flexion in the atlas may force too much extension into other vertebrae, leading to other issues. Iyengar's ankles are gently dorsiflexed (his ankles are lifting from the floor). My ankles are fully plantarflexed.